Where ALAN and PROFESSOR BILL WALDIE pore over BLUEPRINTS. Solar panels and 'sunflower system' gear surround them. Here we're at 34 degrees, 8 minutes. -- so we lose efficiency. keeping the hardware to a minimum. The Phoenix Mars Lander has two circular solar panels that are deployed like the opening of a fan after landing. Colby enters to find Charlie poring over the silo blueprints. having it put in the backyard. A common optimization problem faced by calculus students soon after learning about the derivative is to determine the dimensions of a twelve-ounce can made with the least material, that is, the problem is to find the dimensions of a cylinder with a given volume that minimizes the surface area. 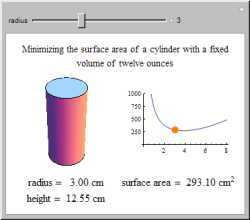 Use the slider to adjust the shape of the cylinder and watch the surface area fluctuate about the minimum of the surface area function. 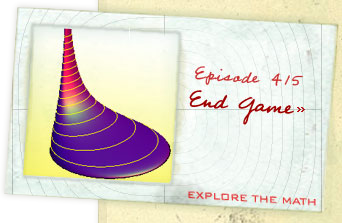 working on the Higgs Boson project. You won't know until you get there. 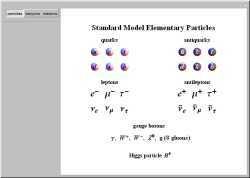 The "particles" setter summarizes the component particles of the standard model: quarks, leptons, gauge bosons, and the putative Higgs particle. The fact that isolated quarks have never been observed is referred to as quark confinement. Baryons and mesons, known collectively as hadrons, exist as combinations of quarks. Baryons, including the proton and neutron, consist of quark triplets. 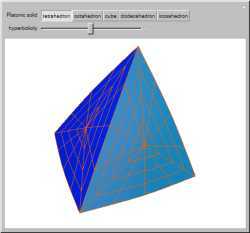 Mesons combine a quark with an antiquark. There also exist antibaryons, made of antiquark triplets. ground. He bends down, picks it up, looks at it. Disgusted. lose the rest of my breakfast. Porter tosses his food in the trash, goes to his motorcycle. David and Colby toss their food, get in the car, start it up. tire, HOMEMADE TIRE SPIKES on the ground. This Demonstration shows how to "hyperbolize" a dodecahedron (and other Platonic solids). 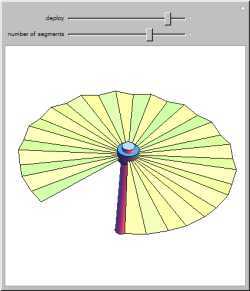 Wind turbine is the precise term. second, an easy 5 kilowatts per day. 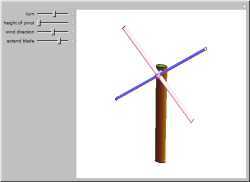 The windmill model consists of a pole, a shaft, four blades, and a spinner. You can control the rotation of the blades, the height of the shaft, the length of the blades, and the direction of the whole assembly.